1 Why Do You Need a Dive Compass? 4 Who Should Use a Compass? 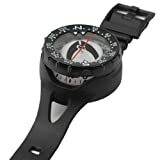 5 How to Care For Dive Compass? The panic starts sinking in. What happens if I can’t find them again? What if something happens to me? 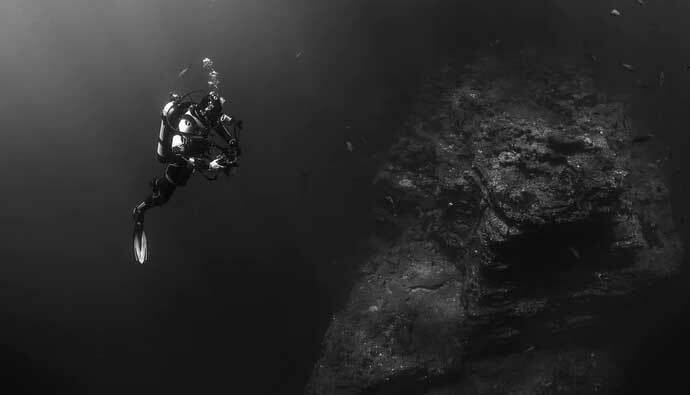 Now extrapolate that feeling to yourself during a dive in the middle of the ocean…YIKES! The ocean is full of magnificent distractions. Use your compass to find your way home if you get lost. You’re best for staying safe during a dive is to have the best dive compass at your disposal at all times. It’ll provide you with accurate bearings readings for navigating underwater, which might just save your life. It can be easy to get lost while diving. Distractions happen while you’re diving. It’s easy to get sucked into the beauty of the scenery or wildlife, causing you to veer off course. I even have a few friends who like to bring their speargun when they go on dives. It gives them added peace of mind and the chance to catch food. 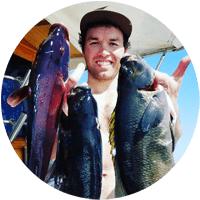 While they are hunting, they can get focused on catching the fish more than their location and the only way back to safety is navigating with the compass. Having a dive compass and knowing how to use it is smart practice. In this article, we’ll cover what a dive compass is, how to use it, how to care for it, and more. Now let’s make sure you get back to your launch point safely! Why Do You Need a Dive Compass? 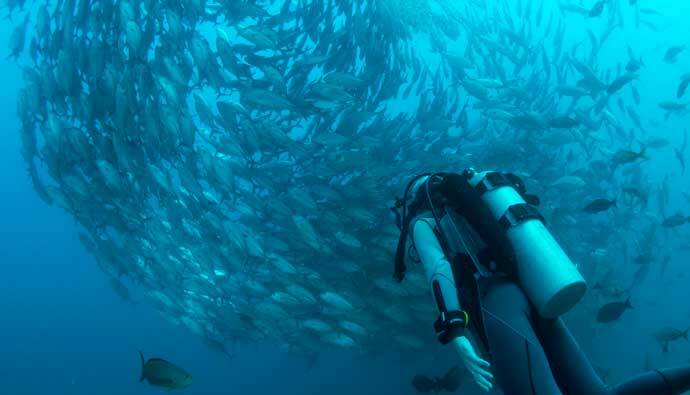 Diving is exhilarating as long as everything goes according to the dive plan. Life tends to get complicated especially when you find yourself dealing with an unfamiliar situation. This can be terrifying, especially if you don’t know how to navigate around. That’s why it’s always important to carry a dive compass with you. A compass is a device that contains a magnetized pointer that interacts with the Earth’s magnetic fields and helps you find the direction of magnetic north and your bearings from it. A compass is different from a GPS in that it won’t tell you where you are specifically on Earth, but if you can use your surroundings you can at least navigate back to where you started. Many of the new dive compasses having GPS, but for it to work you must be on the surface due to the signal from the satellite not being able to penetrate the water. Since navigating is easier under the water, a compass is more valuable while navigating from place to place. Why do you need a compass for diving? Having a compass while diving is actually one of the few ways to orient yourself in the water. 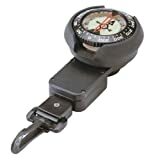 Many experienced divers do not require a compass because they know how to navigate using the environment. Sometimes if the current sweeps you into an unknown area or the visibility is bad, a dive compass can be the only tool that helps you make it back to safety. If you’ve ever dived from a boat, you know easy it is to venture far from it during a dive. If the conditions on the surface make it too hard to swim back, diving back down and using your compass might be your best option. Now that you have a good understanding on why you need a dive compass, let’s look at their features. Knowing how to use your compass is more important than any extra bonus features that come with advanced ones. 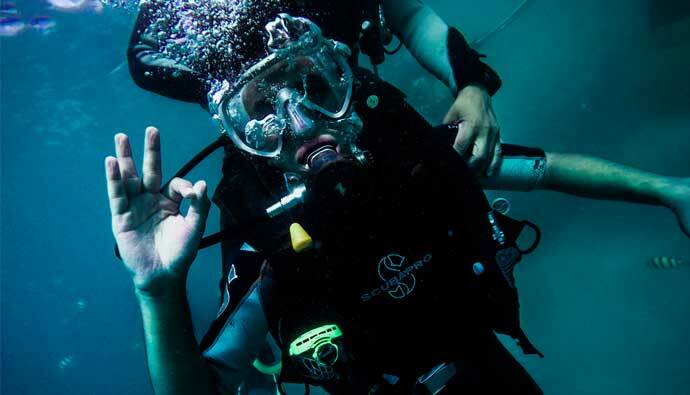 Depending on your setup, you dive compass can be either on your wrist or attached to your BCD. If you’re scuba diving, your compass will most-likely be attached to your BCD in the same location as your air gauge. Some compasses come with a carabiner that will hook to one of your shoulder straps. You can also get a wrist-mounted compass. These are popular if you’re not wearing a wetsuit or if you go freediving. They are roughly the size of a large watch and can be worn on the same wrist or opposite arm of your dive computer. If you’re wearing a wetsuit with long sleeves, make sure your compass comes with a large wrist strap to help you fit around the extra material. Don’t worry if you buy one type and want to change how you attach it to yourself. In fact, check out this cool coversion method that’s simple and cheap. Dive compasses come either analog or digital. Analog compasses are old-school. This means they are easy to care for and are easy to repair. They tend to be cheaper than their digital counterparts. Their simplicity makes them robust and they tend to last…plus they don’t need a battery to operate. For those who tend to leave their electronics uncharged, analog is the way to go. Digital compasses use sensors that react to the earth’s magnetic field. Besides showing direction, the digital compasses can come packed with other features like a thermometer, barometer and time functions (watch & stopwatch). They do require a battery to operate and tend to cost more, but they are easier to read. The lubber line is a line marked on a compass showing the direction straight ahead. Once you’ve set your bearing using the lubber line you’ll be able to follow the compass in a straight line towards your target. Always make sure that you keep an eye on it so you don’t get lost. Analog compasses have a side window to use while setting the line and after it’s set you can follow it by looking straight down at the compass. When using a dive compass you should hold your hands straight in front of you and at eye level. One hand should be holding the compass to support and the other should be used to set the lubber line. Align the side window with your eyes and look at the lubber line. The lubber line will be your direction of travel. If you are using a wrist compass, set the lubber line by holding your hand straight towards the direction you want to travel. Using the side window at eye level and look for the lubber line and adjust the compass towards your heading. You can now use your compass by looking top-down and following your line. Always keep the compass at an even level for an accurate reading. Who Should Use a Compass? When diving in a group, one person should be designated to be the dive leader and they should have a compass. When there are multiple people using compasses, the readings might be slightly different causing people to veer away from each other. If you are the one leading or are by yourself, always stay aware of your surroundings. The last thing you want to do is get tunnel vision staring at your compass that you end up running into a reef, cliff, or shark. Some divers are so focused on their compass that they end up swimming right past their pick up location. Do be that person! How to Care For Dive Compass? After your diving adventure, it is a good practice to clean all your equipment. Cleaning your dive compass is an easy process. All you have to do is rinse it a couple of times in water to remove the salt that has been caught on it. It doesn’t get much simpler than that. You should always check your compass for small cracks in the casing as this can damage the internal components of the compass. Bubbles can form when the compass is exposed to cold. It is known that small bubbles will not affect the accuracy of the compass. But in time, the bubble will grow bigger and that will be a problem. Adhesive and filler fluid (any type of light oil). Start by drilling two small holes in the side of the capsule. Remove the fluid that is inside the capsule using the syringe. After all the fluid has been removed, start adding oil to the capsule using one of the holes and the syringe. When you add oil and start filling up the capsule, all the air inside it will exit through the second hole. After the capsule has been filled, make sure that there are no air bubbles left and start wiping the capsule of excess oil. You want the capsule to be clean before applying the adhesives to fill the holes because they tend not to blend well with oils. Fill the holes with adhesive and you are ready to go. It is not uncommon for compasses to get stuck. This can happen if they are exposed to high temperatures and the materials that the inside of the compass is made to start to expand. One common way to fix this issue is to give your compass a few hard taps using your palm. This will attempt to dislodge the components that are stuck and getting them on their right position. *Before any attempts at fixing a compass, check with the manufacturer’s instructions for best practices for you specific compass. Sometimes you can send them in for a replacement if it’s still under warranty. Once you have the right dive compass you’ll be A-OK! Do you need a compass? If you’re diving with a group and one of your friends already has a compass, the short answer will be, no. It’s still good practice to carry one in case you get separated from your buddy’s compass breaks. If you are diving alone, having a compass is required. There are no road signs underwater that can help you find your way once you’re lost. Where do you want the compass on you while you dive? You want your compass in an easily accessible place. This can be on your wrist or attached to your BCD. The last thing you want to do is have to search for it, wasting precious time and oxygen under water. Do you want digital or analog? Analog compasses tend to last longer than their digital counterparts. They are very accurate and the most important thing about them is that they will never run out of battery. Analog compasses are also cheaper. Even if you have a digital compass, it’s smart to know how to use the analog ones in case you need to use one or borrow one if your digital one runs out of juice. Dive computers tend to have a digital compass in them. They are easy to read and take out much of the learning curve needed for analog. The only downside is that if you forget to charge your dive watch, you’re going to have to use an analog one anyways. Suunto is one of the most popular dive watch manufacturers around. They have made a name for themselves over the years and it’s hard to go wrong with any of their watches. Designed to be your reliable companion wherever you go, the essence of the great outdoors is distilled into Suunto Core. Combining an altimeter, barometer and a compass with weather information. It’s hard to go wrong with a tried and true analog compass. This one will be the workhorse in your arsenal for a long time. Large, easy-to-read bearing indicators on our extremely bright Ocean Glo luminescent floating card make quick work of navigation, especially in limited visibility. This compass had a large ratcheting bezel. The lubber line is very easy to see. This is similar to the Oceanic compass above but it’s meant to be clipped on to your BCD or dive belt. Sherwood is a trusted brand for making compasses and this version is at the top of their list. With exceptional luminescence, this scuba diving compass charges and glows seven times faster than before and lasts seven times longer. That means you can count on it to work for your full dive. Dive tilt allows this compass to work even when tilted on a 30° angle. Q: How to use a dive compass? A: Using a dive compass to find your direction is not hard. Stick your arm straight out towards the direction you’d like to travel and adjust the lubber line to match. Bring your arm down so you can view your compass from top-down. Start traveling in that direction. From time to time, look straight down at the compass to make sure you’re traveling along the lubber line and along the proper bearing. Q: How does a compass work? A: A compass is a lightweight magnet, generally a magnetized needle, on a free rotating pivot. This allows the needle to better react to nearby magnetic fields. Since opposites attract, the southern pole of the needle is attracted to the Earth’s natural magnetic north pole. This is how navigators are able to discern north. Q: The Lubber (Red) line is the direction of travel line on the compass? A: The Lubber line is the direction of travel you’ll go with your arm straight out in front of you. After you set the Lubber line, you can view the compass from top-down and follow it without needing to put your hand straight out again. If you follow the line after you set it, you’ll reach your destination.